On Friday, February 13 the Chaminade middle school and high school fine arts departments joined together to showcase their talented students at the first ever Fine Arts Family Spirit Night. 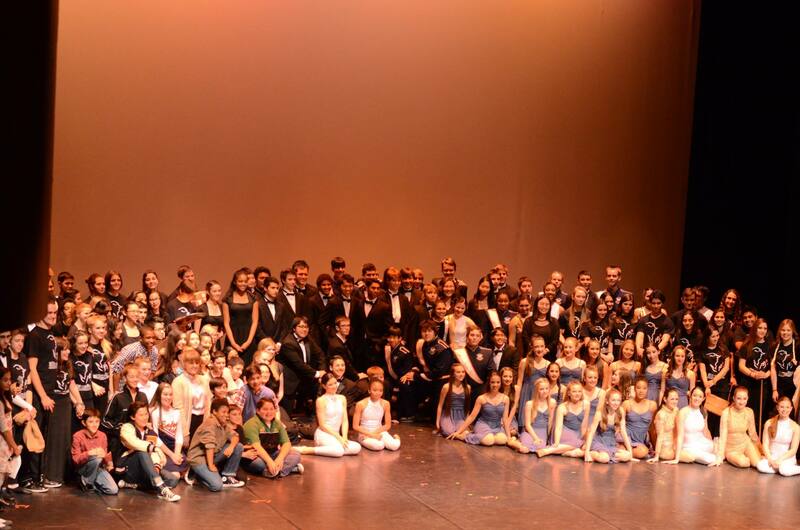 More than 100 students from drama, band, choir, dance, and aerial performed before a sold out crowd at the Tutor Family Center for the Performing Arts. Audience members were also treated to screenings of student films and displays of art work. Alex Mansour ’15 and Hiba Alnajjar ’19 served as emcees for the evening. Chaminade Fine Arts has much to celebrate in the coming weeks. The annual Film Festival will be held Saturday, February 21. In March, the Eagle Regiment Band will be traveling to Spain to perform in an international music festival, and the middle school C-Notes will be travelling to New York City for the third time to perform at Carnegie Hall as the featured choir. The Chaminade Players will also be presenting Disney’s Beauty and the Beast March 13 through 15 and March 20 through 22. Visit Chaminade’s Facebook page to view more photos. This entry was posted in Band, C-Notes, Choir, Dance, Drama, Harmony Chorus, High School, Middle School, Perfoming Arts by Chaminade News. Bookmark the permalink.